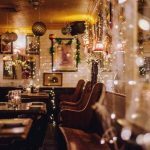 With New York abuzz with holiday merriment and cheer, we scoured the city and beyond to find the quaint neighborhood spots as well as glitzy New York hotspots to enjoy the season. Whether you are looking for comfort food with a twist, Italian, haute French, or steak and seafood, there is something for everyone here. While there is always pressure to have the best New Year’s Eve ever we’ve come up with a few romantic spots or destination restaurants that will not disappoint with unsurpassable menus to ring in the New Year. If you’re looking for a one stop shop, Nolita’s hotspot Ken & Cook has it all. Helmed by Jean Georges alum Artan Gjoni, upstairs serves American nouveau cuisine with a French twist that has a wide selection of fresh raw bar options and contemporary brasserie fare in a vintage downtown setting with exposed brick, tin ceilings, leather banquettes and wood paneled walls. Start with the raw bar seafood tower with a plentiful variety of daily shellfish. The dinner menu can easily transition to late night bites with classic comfort fare with a luxe twist in dishes such as fried chicken with honey biscuits, fried oysters with siracha, short rib with crème fraiche horseradish, and snapper in lobster consommé. Post dinner engage in some late night revelry downstairs in their cellar bar that has become downtown’s destination stop, Lil Charlies, that channels the 70s disco glam with a sparkling disco ball and a shimmery bowed ceiling, which also happens to serve the best mojitos in town. At first glance this quaint East Village eatery looks like you may have missed your stop and are in the hipster-centric, Williamsburg. It has all of the requisite trappings of a Brooklyn hipster hangout, the seating uses reclaimed church pews, the exposed brick walls are decorated with vintage car facades, twitter and instagram is encouraged, and the bar only features obscure craft liquors. But it’s not until you taste their sophisticated twist on comfort food that you know you are in Manhattan. Everything from their drinks to their small plates are made to share, and with only 8 tables, expect a bit of a wait. Highlights from the menu are the spicy, sticky & sweet wings, the mouthwatering French dip dumplings with mozzarella and au jus, overstuffed baked clams and fish with tomatillo salsa burritos. Get the party started with a potent fish bowl sized cocktail for two (or three) such as the Pacific Palm with vodka, lime and coconut, or a Mega Michelada with beer, tequila shots, with a side of lime & siracha. Famed restaurateur, Sirio Maccioni has brought his signature panache to the Pierre hotel as a more casual outpost to his formal Le Cirque. Like all celebrity chefs he has a line of products, an empire of restaurants around the world and a circle of BFFs that include celebrities, jetsetters and moguls. One of the reasons why he rose to fame and was able to keep his post is his consistency of always serving delicious authentic Tuscan fare. His menu is largely inspired by his youth, growing up in Tuscany, and some of his most famous and popular dishes are the tuna tartare with mango, truffle porcini mushroom soup, lobster tagliatelle, lamb ragu papardelle, seared sea scallops, and Mediterranean branzino. Even if you can’t get out of work early, their happy hour from 5-7 serves $1 oysters and $5 local, craft, and Italian beers, which is a mere bargain in this posh area. 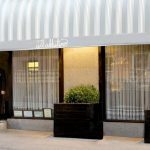 If you can’t score a reservation at the famed Downtown Il Mulino, try Trattoria Il Mulino, which is the more casual, light and airy contemporary offshoot from the original predecessor. Specializing in fare from the Abruzzo region, start with the clams oreganata, or ossobucco sausage to whet the appetite. Thin crust pizzas are baked to perfection with epicurean toppings such as truffle and porcini mushrooms, sopressata sausage and basil and their famous ricotta meatballs. Fresh and simple grilled seafood changes daily, while meat dishes feature classic preparations such as lamb steak, veal parmagiana, and spicy Cornish hen. 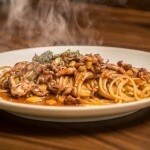 Known for their specialty pastas, highlights include spaghettini with spicy crab and lemon, as well as pasta with clams, broccolini and spicy sausage. For over two decades, their signature sauces, Vodka, Marinara, and Bolognese have become so beloved they even bottled them so diners can relive this experience at home. Even if you can’t get a table, dine at the bar with a lively scene brimming with the young and beautiful professional crowd, this Flatiron hotspot surely won’t disappoint. As a sister stateside trattoria to the Antica Pesa in Rome’s Trastevere neighborhood established in 1922, this Williamsburg culinary gem is helmed by jetsetter Roman brothers Francesco and Simone Panella who have convinced their celeb friends to cross the river to this side of the city. Like Williamsburg, Trastevere was considered to be outside of the city, separated by a body of water from Rome, and it had experienced a renaissance in the 50s, just like Williamsburg is undergoing now. What they hope to achieve is a contemporary Italian spot serving authentic Roman fare. Winners to start with are the grilled octopus with cannellini beans, or house smoked duck breast. Pastas are well balanced and packed with flavor like the robust schiaffoni all’amatriciana and lasagna with lamb ragu. The braised meat dishes like oxtail or the pork loin with slow cooked pork belly are perfect for those cold winter nights. 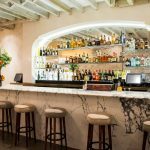 Be sure to try a bespoke craft cocktail that pays homage to the origins of their Roman roots such as a tequila with yuzu and passion fruit, or the whiskey with chai absinthe, and bitters. These cocktails are perfect to sip on a plush leather couch by their fireplace, just don’t drive scooters home, as their menu suggests. Destined to be the next LES late night hotspot, stepping into Louie & Chan is like going back in time to the LES 80 years ago when Ellis Island immigrants in search of a new life inhabited it. Everything from the mottled copper walls, and antique lamp fixtures suggest an Italian restaurant with a hidden speakeasy befitting of the Godfather situated on the edge where Chinatown meets Little Italy. The owners created a tale based on Louie & Chan where Luigi was a cobbler for the circus with a penchant for Old World Neapolitan food and Tu Sing Chan was an eccentric Chinese circus performer who worked together to create an Italian restaurant on the ground level and a secret opium den underneath. Fast forward 88 years, the only remnant of the origins is a pair of stilts on display in the main dining room. When it comes to the dining, the chef serves a selection of small plates, pizzas and pastas that are brilliantly executed. Start with the grilled octopus, fried artichoke, blistered shisitos, or seared scallops. Or share the imported salumi plate or assorted seafood crudo plate. Main courses range from carmelized artichoke pasta or squid ink frutti di mare linguine and pizzas from a wood-burning oven with tantalizing combinations like porcini mushrooms and truffle. To the side of the restaurant is an intimate private vintage dining parlor reminiscent of where the Dons would convene. Hidden beneath the stairs is subterranean Asian-inspired cocktail den filled with Chan’s circus relics and Chinoiserie serving Asian inspired libations and the speakeasy, 303 that features world class DJs playing to the wee hours of the night, and the only thing left outside of the velvet ropes is pretension. 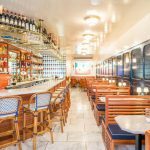 Nestled between the bustling theatre and garment districts, Appetito Ristorante has been an Italian neighborhood favorite over the last 20 years. Channeling the warmth and coziness of an Italian countryside trattoria, their specialty is in producing home style Italian cuisine with signature dishes including baked clams oreganata, spaghetti Bolognese, fried calamari, rigatoni all’amatraciana, veal scaloppini with mushrooms in a brandy cream sauce and chicken in a champagne shallot sauce. By bringing the warmth of Old World Tuscany with the frescoed walls and skylit ceilings together with the modern sensibility of New York, Appetito is a perfect destination for aficionados longing for an authentic taste of Italy. Discover the next top chef while dining at L’Ecole. Every meal is produced by some of the most talented students and teachers at the prestigious International Culinary Center, and some of whom have become household names in the culinary scene. Prix fixe menus start at $44 for a 3 course menu and $59 for a 4 course menu, a mere bargain in the city for haute French cuisine that really showcase the talents of the students. Choose from a selection of delicious appetizers that use seasonal ingredients like saffron gnocchi with mussels and chorizo or petatou – a warm potato, goat cheese, olive, tomato fondue. The mains are so tempting it will be hard to choose between smoked scallops with butternut squash puree, seared local bass in a smoked shallot sauce, and sautéed hangar steak. Leave room for the dessert as the ICC has one of the best pastry programs in the country. 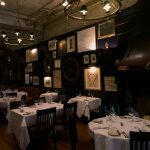 Known for his dry aged steaks and showmanship, David Burke’s unique take on American classics shines through his menu at David Burke Prime. Inspired by the way pink Himalayan ages steak to perfection with an enhanced flavor in the drying room, he uses thousands of the same bricks of warm pink salt to cover the walls in the dining area which emanate a soft amber glow that balances his curated collection of glass artwork. Even if you’re not a carnivore, there is an extensive raw bar selection and every Monday is Lobster night with a $35 prix fixe lobster based menu featuring bisque, tacos or dumplings followed by a 1-1/4 lobster prepared in a variety of savory styles- spicy kung pao, carbonara in a bacon & cream pasta, roasted or steamed. Carnivores will have a variety of choices when it comes to steak- choose from the classic filet mignon, braised short rib or prime rib. Meat connoisseurs will delight in the curated salt brick beef selections hand picked by David himself- theres the 35 day old Kansas sirloin, 30 day Kentucky ribeye, 35 day porterhouse, a rare 60 day sirloin and even a 75 day dry aged ribeye. If there’s still room for dessert, David Burke is known for his creative desserts like bite sized cheesecake lollipops, and rich drunken donuts and his decadent molten chocolate cake. Sometimes it’s hard to remember that West Chelsea, in its sea of highbrow art galleries and multi million dollar lofts, was once home to the shipping industry with longshoremen populating the area. 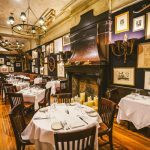 Housed in a landmark building dating back to the 1800s, Moran’s is like snapshot of New York’s historical past. Waterford crystal and Tiffany lamps line the brick and wood paneled walls along with a cherry wood bar that even survived prohibition. With the vibe of an inviting and friendly Irish pub, Moran’s seems like a place you would find in Wall Street but it’s in the heart of Chelsea serving traditional and contemporary gastropub and classic steak house fare. For a hearty appetite, the Sheppard’s pie, filet mignon, chicken pot pie, baby back BBQ ribs, and lobster mac n cheese are tempting comfort foods. Those looking for something lighter can opt for the lobster pot pie, fish and chips, baked clams, or lobster and crab ravioli. It’s the perfect spot to spend a cold winter night. If this winter cold spell has you longing for the pristine azure waters of the Aegean sea, Midtown’s newest Greek eatery, Nerai, can transport you there. Housed in the former Oceana, this elegant multi level space channels Mykonos with its high ceiling billowing with a white canopy, white washed walls and plush white furniture accented with hints of Mediterranean blue and dark wood. 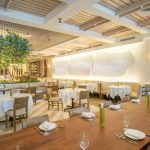 To keep the authenticity of their sophisticated Greek cuisine, executive chefs Ioannis Markadakis and Chris Christou have created a menu that seamlessly blends traditional dishes from grandma’s kitchen with contemporary Greek infusions. Crowd pleasing favorites include their fresh seafood by the pound flown in from the Mediterranean paired with oregano fries, grilled octopus, lobster crab cakes, grilled lamb chops and short rib youvetsi. All of their potent elixirs are named after Greek mythological figures like the Persephone with pomegranate, St Germain, & prosecco, or the Icarus with gin, crème di violette and mastiha which will make you feel like an Adonis afterwards. Though navigating through the theatre district during the holidays can prove to be an obstacle course, make your way to Victor’s café for a little slice of Havana where Cuban classics are mixed with modern influences. You can’t help but feel a bit of nostalgia from the skylit atrium surrounded by palm trees, and photos of Mambo kings in 1950s Havana. For winter, Victor’s has changed some of the items to incorporate hearty meaty items to warm the soul on a cold winter day like ropa vieja- a slow braised pulled skirt steak in pepper and garlic, braised oxtail, and snapper with a green plaintain crust. They are known for their signature mojitos and serve over 1000 per day, the most famous is the 50th anniversary mojito, but others infused with guava, passion fruit or coconut have an original twist and, outside of Cuba, can only be found here.